Whit Monday is the name used in the United Kingdom for Pentecost Monday, the day following the Pentecost festival (called Whit Sunday in the UK), the Christian festival commemorating the descent of the Holy Spirit on the disciples of Jesus after his ascension from earth to heaven on Ascension Day, held annually on Pentecost Sunday. Whit Monday is a public holiday in many countries with Christian traditions (where it is referred to as Pentecost Monday). It was a bank holiday in the United Kingdom until 1967, but has now been replaced by the fixed Spring Bank Holiday on the last Monday of May. 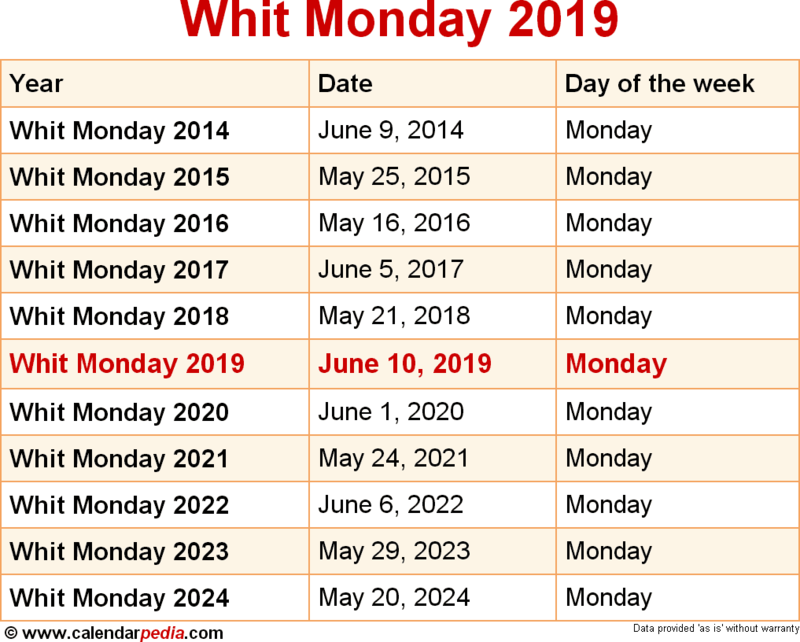 When is Whit Monday 2020? The next occurrence of Whit Monday is marked in red.